Some 41,000 years ago is not only the age of the Campanian-Ignimbrite eruption and the sudden arrival of people with Aurignacian culture (most probably Homo sapiens) to the heartland of Paleolithic Europe: the Franco-Cantabrian region, sealing the fate of our Neanderthal cousins. Some 41,000 yeas ago is also, we are told now, the date of the latest polarity reversal of planet Earth. Researchers from the German Research Centre for Geosciences (GFZ), Norbert Nowaczyk and Helge Arz, have found that around that date, any hypothetical compass would have been for some 440 years (est.) completely lost. Some of that time the compasses would have pointed South and the rest the magnetic field was so messed up that failed its normal role of protection against solar radiation, which was then surely rather dangerous for life on Earth. Sources and more details: GFZ, PhysOrg, Before It’s News. This is potentially an important discovery that may affect the chronological frame of the simians (what ultimately include us also). The Western section of the Great Rift (or East African Rift) is not a lot younger than the Eastern section, as was believed until now, but of the same age (c. 25 million years). E.M. Roberts et al., Initiation of the western branch of the East African Rift coeval with the eastern branch. Nature Geoscience 2012. Pay per view. The East African Rift System transects the anomalously high-elevation Ethiopian and East African plateaux that together form part of the 6,000-km-long African superswell structure. Rifting putatively developed as a result of mantle plume activity that initiated under eastern Africa. 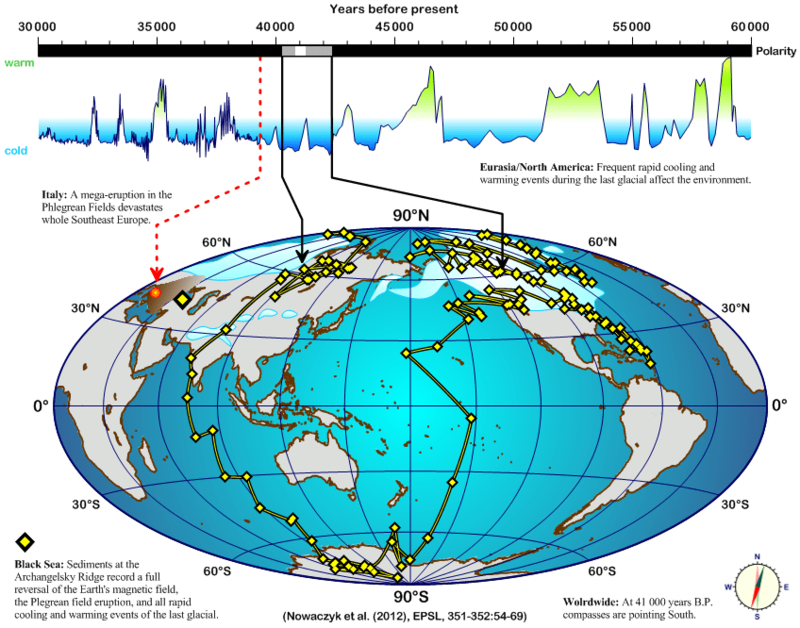 The mantle activity has caused topographic uplift that has been connected to African Cenozoic climate change and faunal evolution. The rift is traditionally interpreted to be composed of two distinct segments: an older, volcanically active eastern branch and a younger, less volcanic western branch. Here, we show that initiation of rifting in the western branch began more than 14 million years earlier than previously thought, contemporaneously with the eastern branch. We use a combination of detrital zircon geochronology, tephro- and magnetostratigraphy, along with analyses of past river flow recorded in sedimentary rocks from the Rukwa Rift Basin, Tanzania, to constrain the timing of rifting, magmatism and drainage development in this part of the western branch. We find that rift-related volcanism and lake development had begun by about 25 million years ago. These events were preceded by pediment development and a fluvial drainage reversal that we suggest records the onset of topographic uplift caused by the African superswell. We conclude that uplift of eastern Africa was more widespread and synchronous than previously recognized. This study provides new evidence that the two rift segments developed at about the same time, nearly doubling the initiation age of the western branch and the timing of uplift in this region of East Africa. “A key piece of evidence in this study is the discovery of approximately 25 million-year-old lake and river deposits in the Rukwa Rift that preserve abundant volcanic ash and vertebrate fossils,” Roberts said. These deposits include some of the earliest anthropoid primates yet found in the rift, added Nancy Stevens of Ohio University. The findings imply that around 25 to 30 million years ago, the broad uplift of East Africa occurred and re-arranged the flow of large rivers such as the Congo and the Nile to create the distinct landscapes and climates that mark Africa today.